Web Print is a feature in PaperCut that we are evaluating that will allow a user to print from any device via a web browser. This means you don't have to worry about having your computer set up with your official MCAD short username (i.e., "gforman") or be running the PC Client app. This feature ONLY SUPPORTS PDF FILES. 1) Log in to your PaperCut account at papercut.mcad.edu. 2) Click on the Web Print tab at left. 3) Click the Submit a Job link on the right. 4) Select which printer you want to send to. For now we have only enabled this feature on two print queues: SB-Konica-Color and SB-BW-Manual-Feed. Click the Print Options button at right. 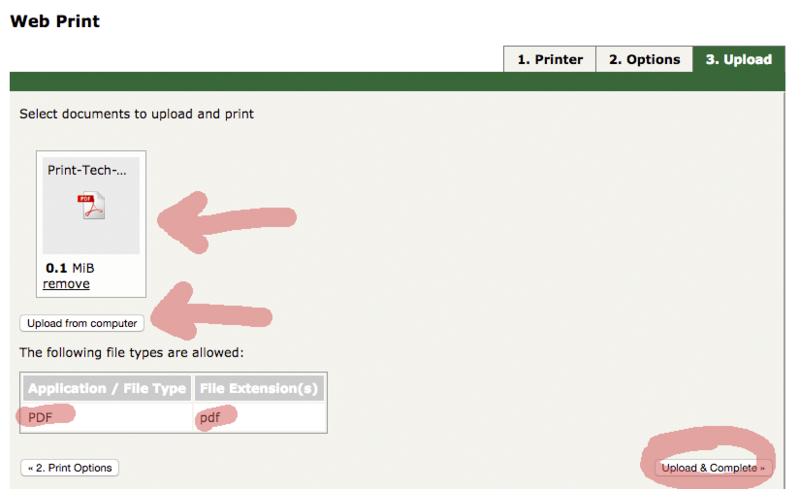 5) Select how many copies of your document you want then click the Upload Documents button at right. 6) Upload your PDF document. From a regular computer you can drag files to this window. From an iOS device you can select documents you've saved to your iCloud account (you can email a document to your device, then choose to save it to your iCloud account). Click the Upload & Complete button. 8) Your document will then process and either be held in the SB-BW-Manual-Feed queue, or forwarded to the SB-Konica-Color queue. Stop into the SB to have your file(s) released.